This recording was made on 22 August 2005, at Lee Harwood's flat in Brighton. ROBIN HOOD IN THE DARK AGES, Permanent Press, 1985, foreword Tom Raworth. THE RED AND YELLOW BOOK, Textures, 1986. QIRYAT SEPHER, Galloping Dog, 1988. TCL, Pig Press, 1989, afterword Lee Harwood. THE NEXT WAVE, North and South, 1990, afterword George Evans. REMEMBER REMEMBER, Poetical Histories, 1991. LYRIC LYRIC, Reality Street, 1993, afterword Rosmarie Waldrop. SATURDAY NIGHT IN THE BARDO, West House Books, 1996. MELANIE'S BOOK, West House Books, 1996, afterword Iain Sinclair. THE NAME APOLLO, West House Books, 1997. WHEN SUZY WAS, Shearsman, 1999, afterword Roy Fisher. YOUR THINKING TRACTS OR NATIONS, West House Books, 2001. NEW AND SELECTED POEMS, Shearsman, 2004. ROGER HILTON'S SUGAR, Leafe Press, 2005. THE NEW BRITISH POETRY, Paladin, 1988. FLOATING CAPITAL, Potes and Poets, 1991. CAMBRIDGE CONFERENCE OF CONTEMPORARY POETRY, Cambridge, 1991/1996. POETS ON WRITING, Macmillan, 1992. PROSPECT INTO BREATH, (interviews) North and South, 1992. EXACT CHANGE YEARBOOK, Carcanet/Exact Change, 1995. CONDUCTORS OF CHAOS, Picador, 1996. DANSE MACABRE, West House Books, 1997. SNEAK'S NOISE: POEMS FOR R F LANGLEY, Infernal Histories, 1998. THE OTHER: BRITISH AND IRISH POETRY SINCE 1970, Wesleyan University Press, 1999. APRIL EYE: POEMS FOR PETER RILEY, Infernal Methods, 2000. A MEETING FOR DOUGLAS OLIVER, Street Editions/Poetical Histories, 2002. FOR TOM AND VAL, Pressed Wafer, 2004. Readings: Cambridge Conference, Cheltenham festival, Poetry Café, Sub-voicive London, Cork (capital of culture) and St. Ives festival etc. Publisher of Gratton Street Irregulars, a very occasional pamphlet series. "Kelvin Corcoran has allied a strikingly individual intelligence to a genuinely musical sensibility." --Don Paterson, The Observer. "Corcoran emerged into view around 1985, with the piquantly entitled Robin Hood in the Dark Ages, and has produced consistently ever since - something which is true of no other individual. It is this strength and calm which have made him a giant figure of the middle generation..."--Andrew Duncan, Poetry Salzburg. "Kelvin Corcoran's new book ... Largely responds to time spent in Greece. His sense of wonderment at the geographical location of so much myth and literature takes the form of a meditation on presence - in a manner that is both intellectually and emotionally probing. His concern for presence at times recalls a high modernist ambition to reflect culture as a whole. More often though, it takes the form of poignant glimpses of his own emotional life with his family. It is his easy movement between these two that makes this book so engaging." --Devin Johnston, Chicago Review. 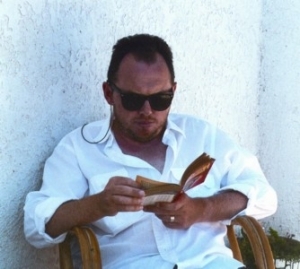 "Corcoran is so skilled with his line and subject matter, he can help us wake up through his writing: he sweeps from the ancient to the contemporary and back again, often in the same short stanza. ...His work is linguistically complex yet, emotionally, socially, politically and, above all, poetically (musically) alive." -- Andy Brown, Stride Magazine. "Much of Corcoran's later work explores the possibility of being saved; this of course, is a reworking of the idea of elegy, as if he is standing in the same place, but looking firmly in the opposite direction. ...Corcoran's austere, 1980s style embodied the politics of the left under siege - it was full of anxiety and anger. The more recent works... change the focus without losing conviction. They celebrate the possibility of utopia..."-- Charles Bainbridge, The Guardian.